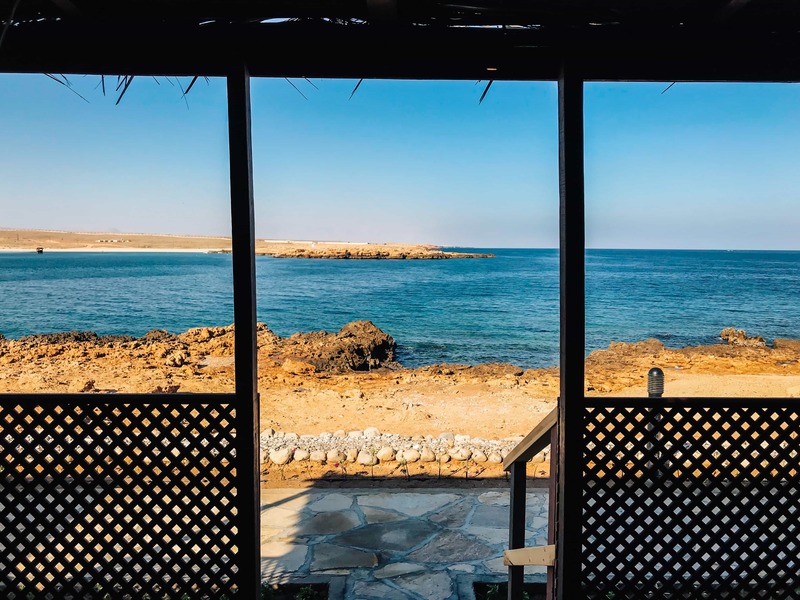 I’ve heard nothing but amazing things about Oman, and so when I realized that I’d be nearby while visiting the UAE, I decided to figure out how best to experience the country. 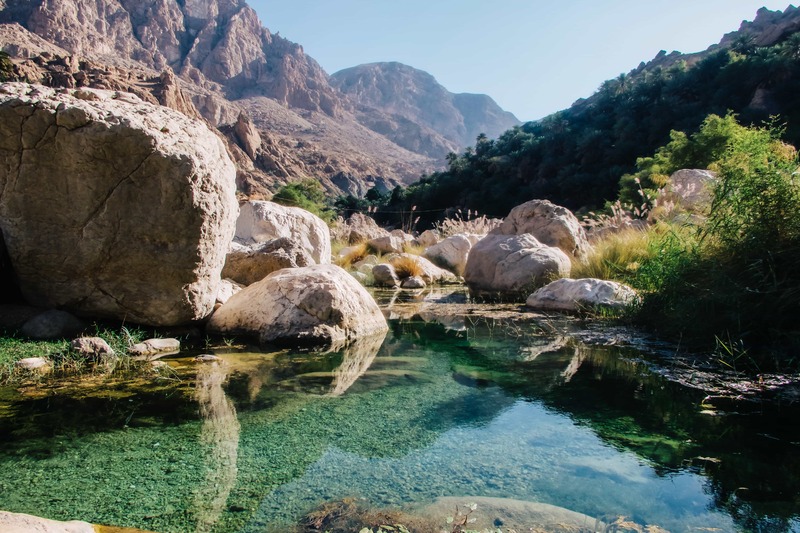 Free camping is legal in Oman, and so I considered renting a car and winging it daily with a friend, but when I found Oman Safaris, I realized that it made so much more sense to be shown around by a local rather than try to experience it on our own. 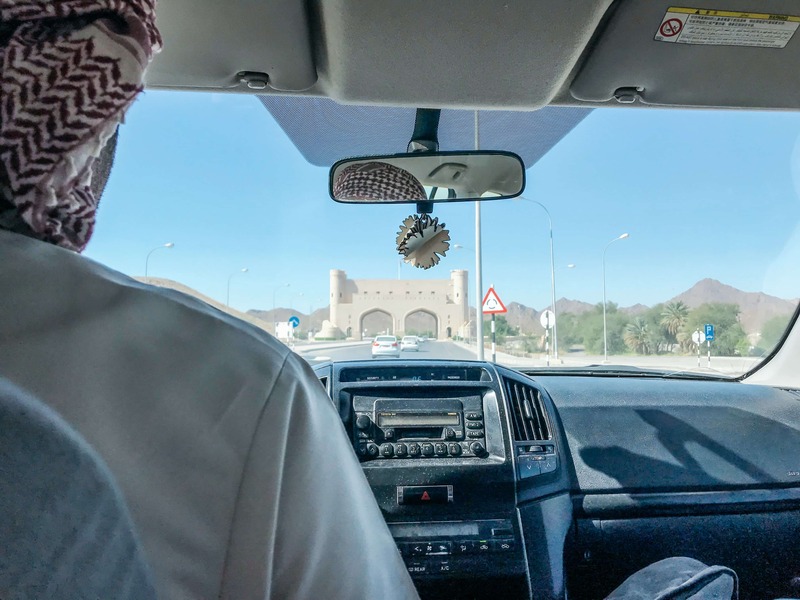 Hamad, the Tours Manager, picked us up promptly at the Muscat Airport to begin our 3 night, 4 day “Discover the Pearl of the Orient” adventure through Oman. 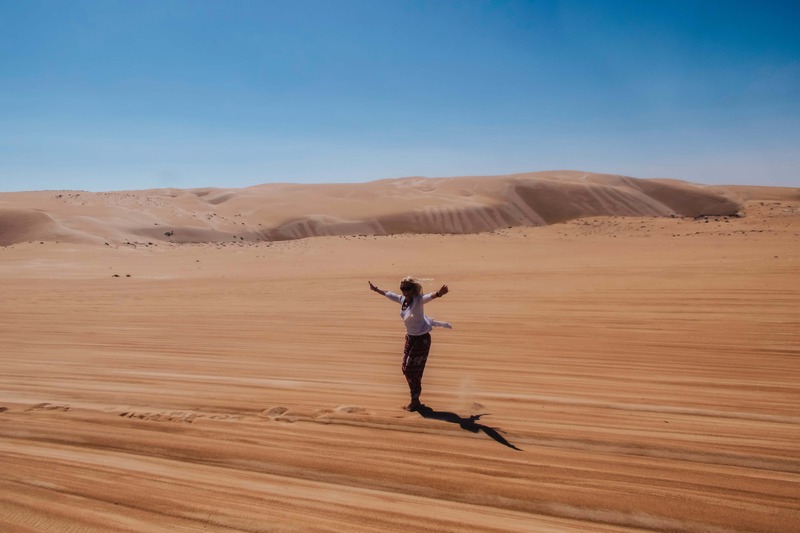 In those four days we ended up covering far more of the country than I thought possible – to the point where we didn’t miss anything I had wanted to see! Hamad arranged everything from transportation (he was our guide and driver after all) to food to hotel bookings. 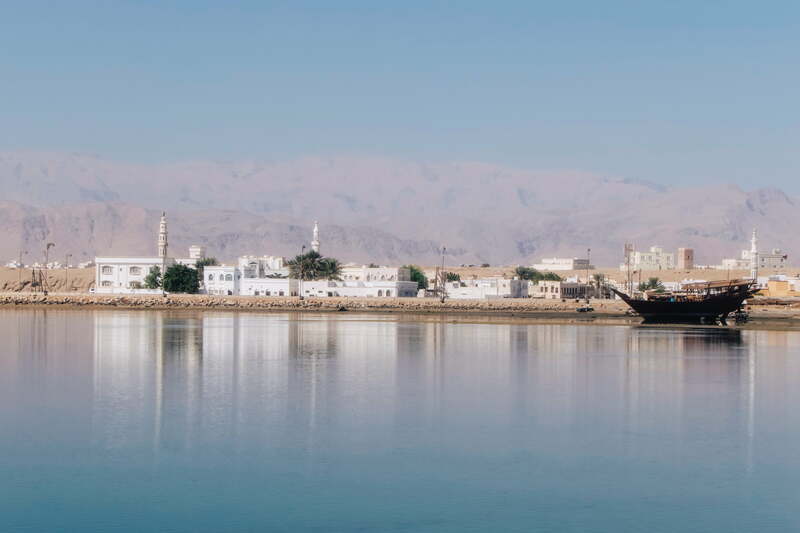 We were instantly surprised at how mountainous Oman was. 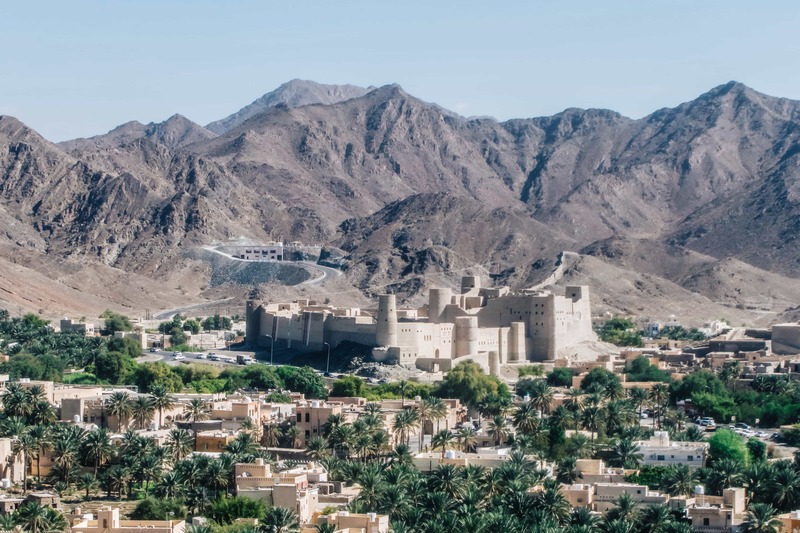 When you think of the Middle East, you don’t typically associate it with mountains; we did, however, discover that Oman is 36% mountains and 28% desert. 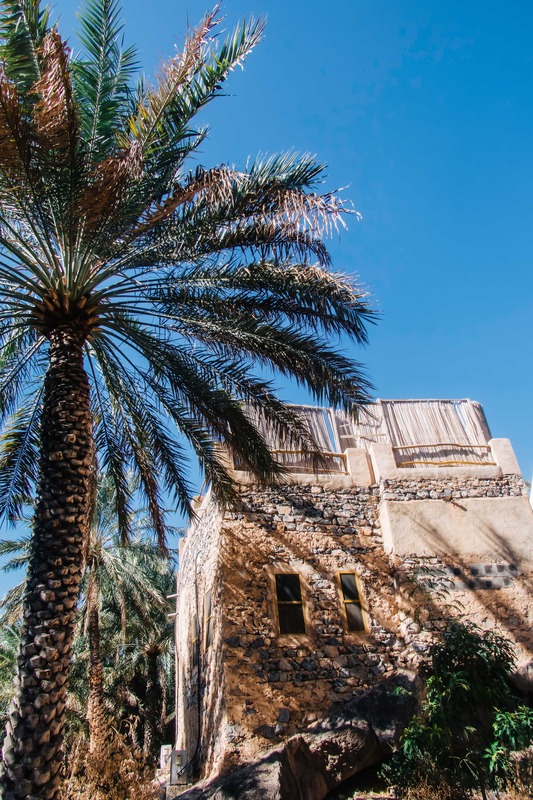 We also learned that there are 27 million palm trees in the country and that the highest recorded temperature is 58 degrees Celsius, which is painful for me to even think about much less come to terms with. 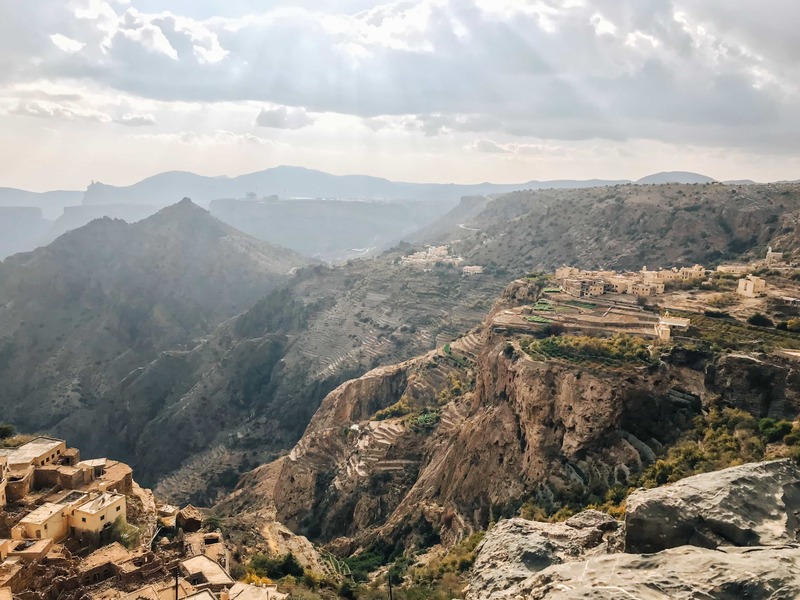 Our first stop of the day was at Bourkat Al Mouz, which offered a beautiful view over the East Hajar Mountains before we officially entered the Jebel Akhbar pass. 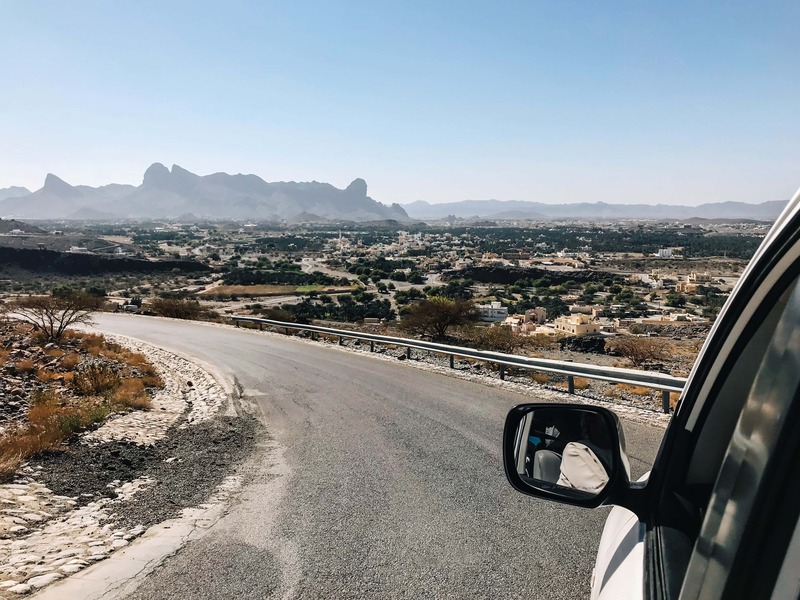 In order to access Jebel Akhbar you need to have a 4×4 car, and it is checked at a security point, because of how steep the mountain roads get. And had a great lookout at Wadi Bani Habib, a place I had deemed inaccessible had I driven on my own. 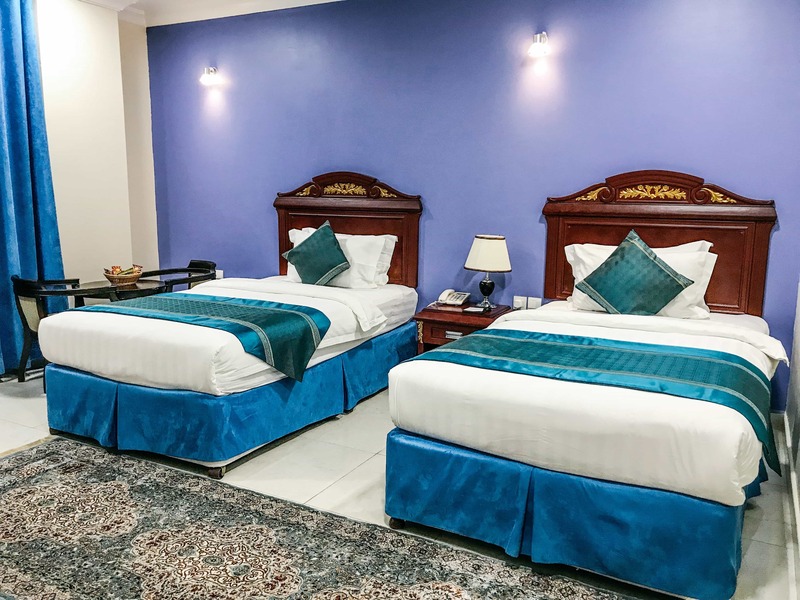 We spent the night at the Al Diyar Hotel in Nizwa, where we had a delicious dinner and got to bed nice and early. 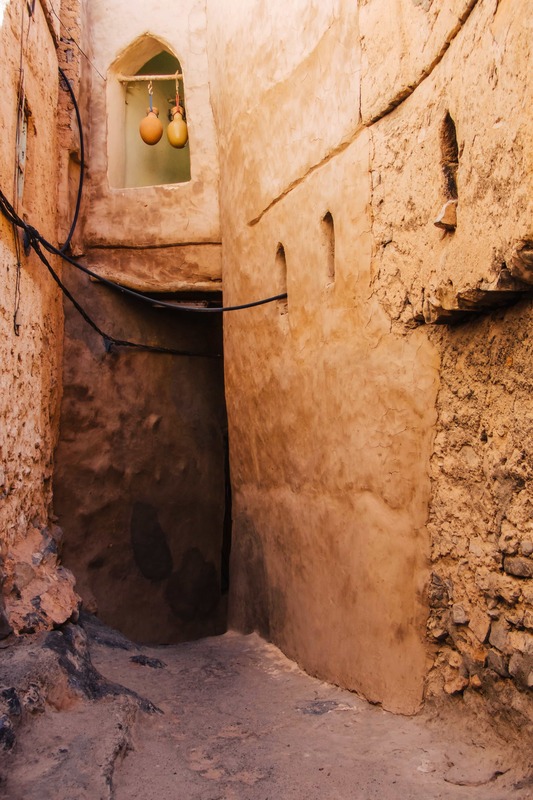 We were up early for breakfast at the hotel before going to Nizwa Fort and wandering through the Nizwa Souq. 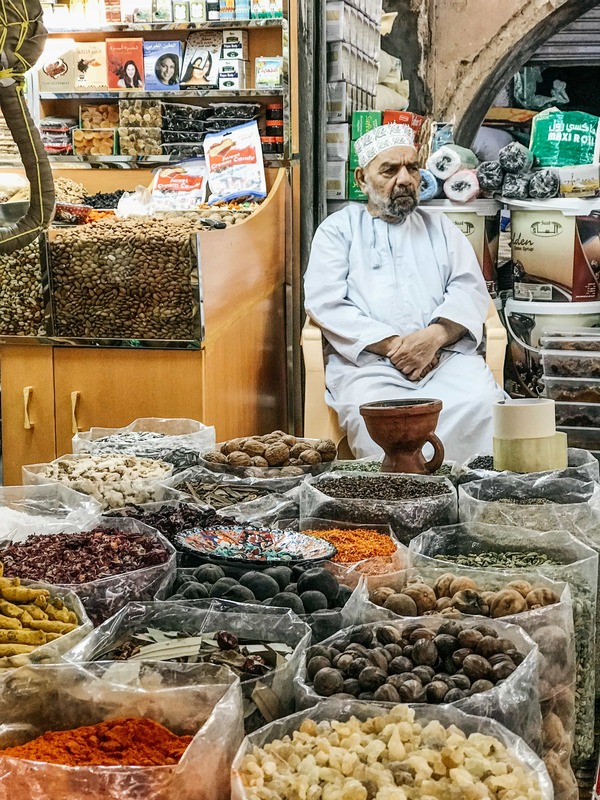 In the Souq we tried Halwa, and a slew of dates from all over the Middle East. The dates from Saudi Arabia truly melt in your mouth and are one of the best things I’ve ever tasted (so I may have indulged slightly). We then made our way to Misfat al Abryeen. 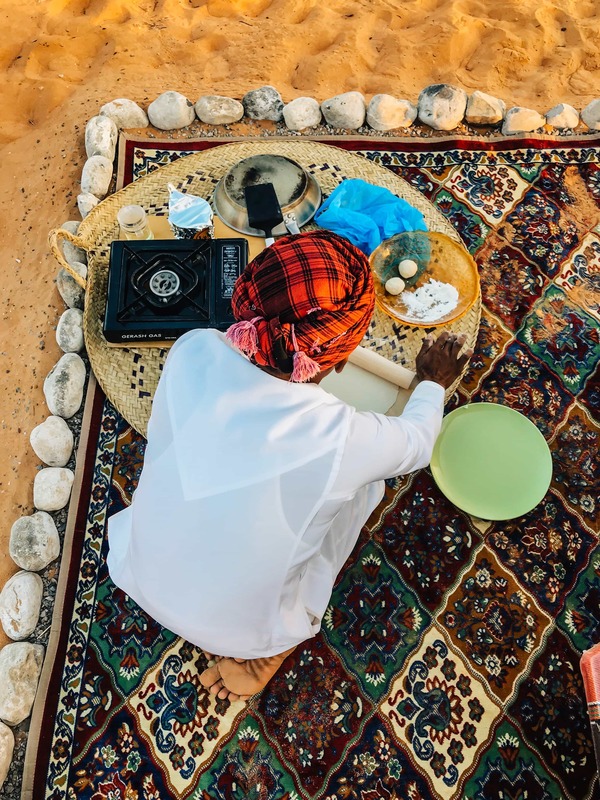 Misfat means “high” and “Al Abryeen” is the name of the local tribe. 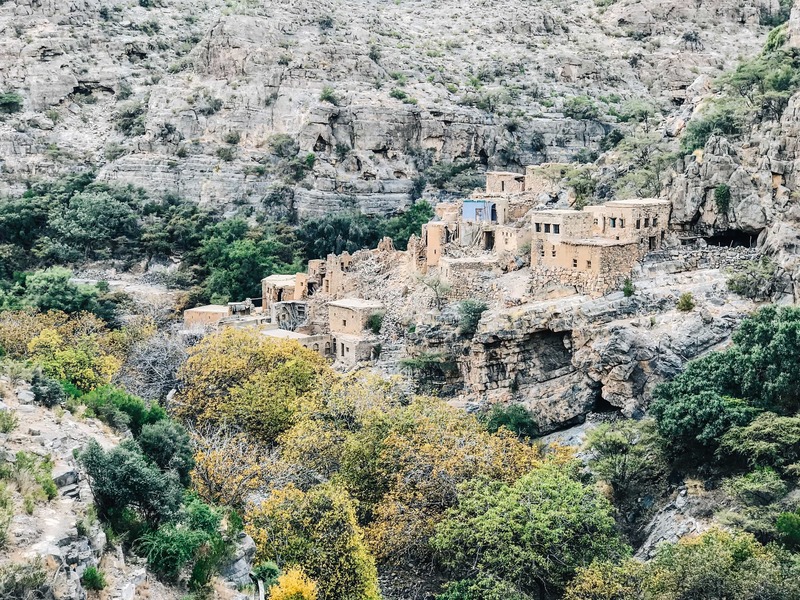 This mountainous village is about 600 years old and composed of houses largely made of stone. 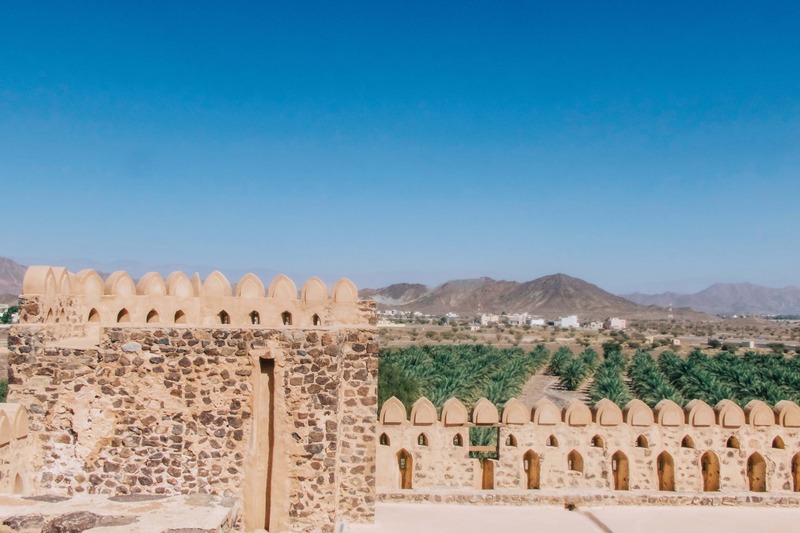 We stopped at the Bahla Castle Viewpoint before continuing forward to the Jibreen Castle. The Jibreen Castle was empty when we arrived, so we had a great time exploring all of the empty halls and making our way to the roof for some lovely viewpoints. 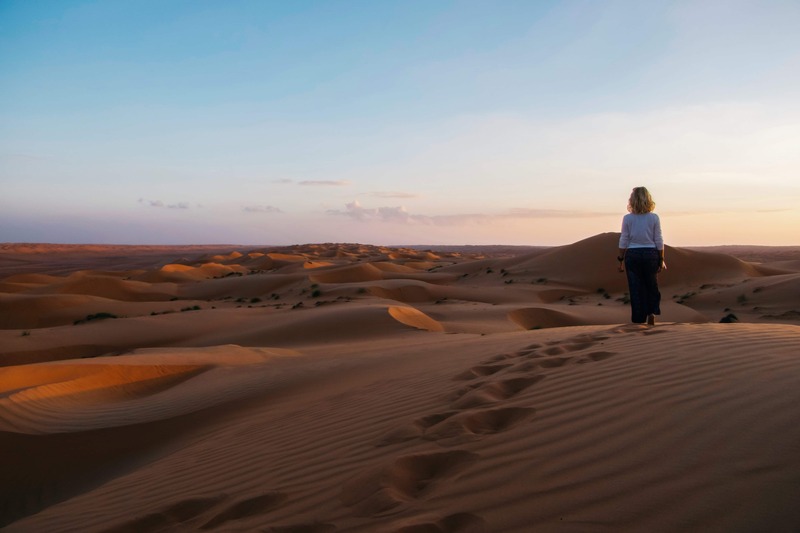 It was then time to go into the desert with Oman Safaris! It was fascinating to watch the landscape turn from incredibly mountainous to the vast desert before our eyes. We arrived at our desert camp right before sunset. 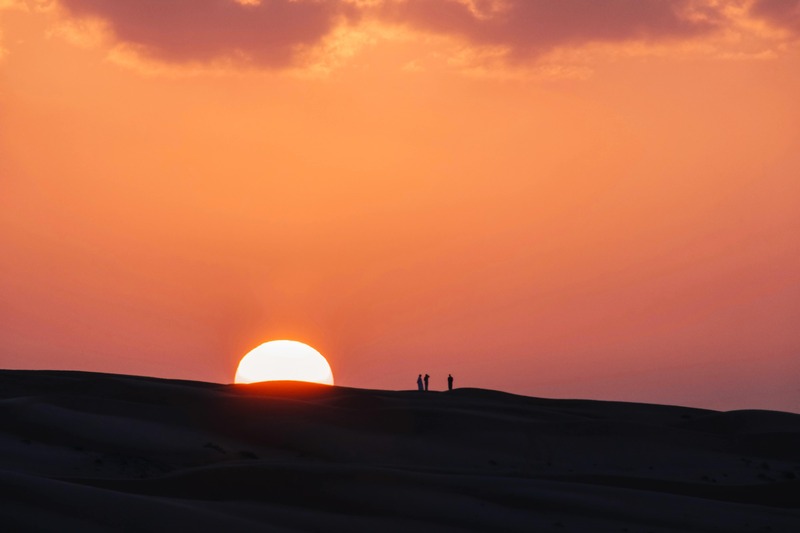 Hamad and his wife Jacqueline drove us over the sand dunes to a perfect vantage point to watch the sun go down before heading back to camp. 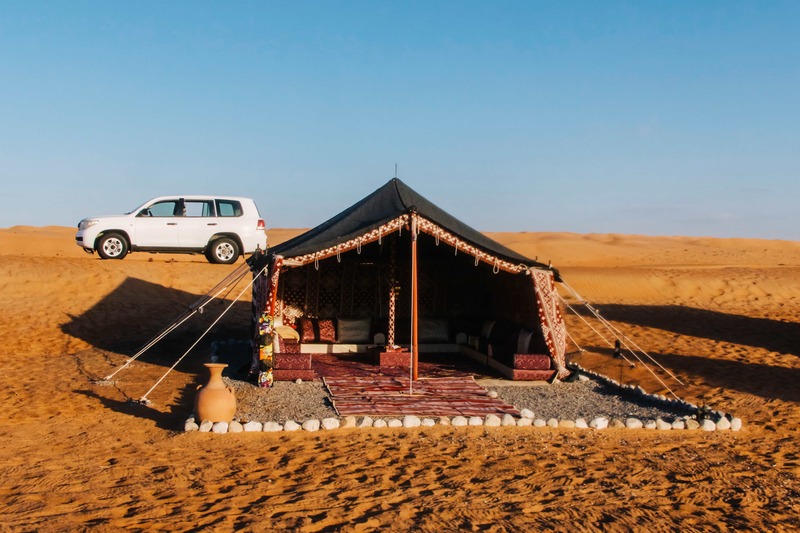 Hamad’s desert camp with Oman Safaris is indescribably beautiful. 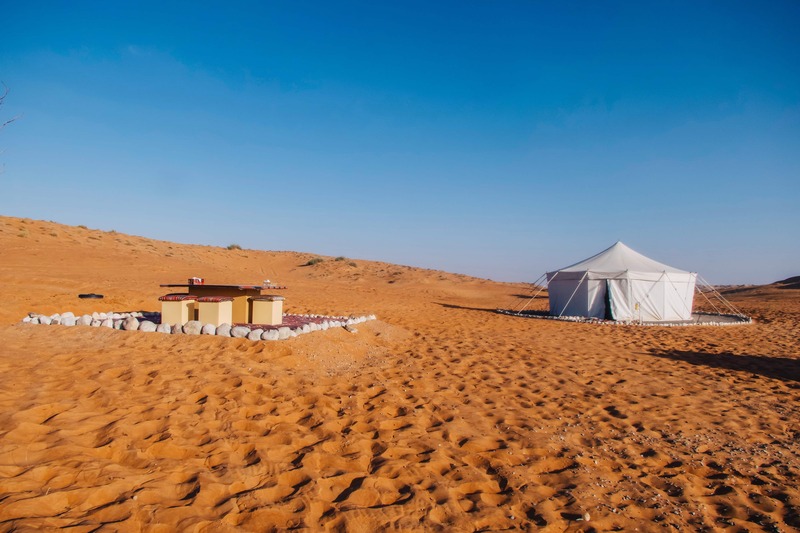 It’s hard to put into words what it feels like to be in the middle of the desert, in a luxury tent and comfortable bed, surrounded by silence and an incredible night sky. 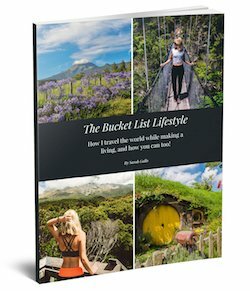 It’s one of those things that you just have to experience for yourself. As we watched the stars come out, dinner was being made underground. 45 minutes later, a delicious dinner was served for us in our tent. It’s amazing just how well one can sleep in absolute silence. Since we were surrounded by sand dunes on every side, I decided that I wanted to wake up for sunrise. When my alarm went off at 5:15am, it was still pitch black and starry as I made my way up the dunes. Before I knew it, the sun was rising and it was a spectacular site. After sunrise, breakfast was made in front of us and consisted of eggs, local homemade bread, honey and cheese, watermelon, and a mango parfait. Everything was delicious. 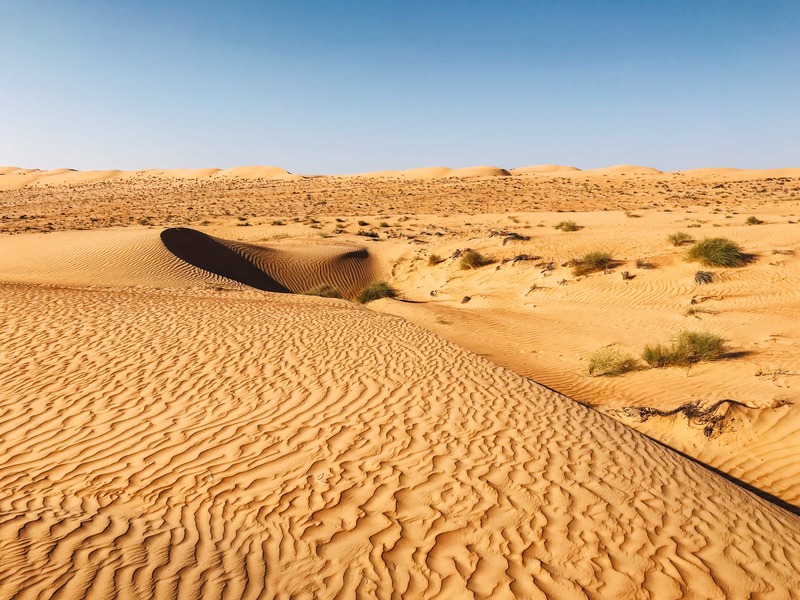 We learned that the desert is 90 km East to West and 190 km North to South. 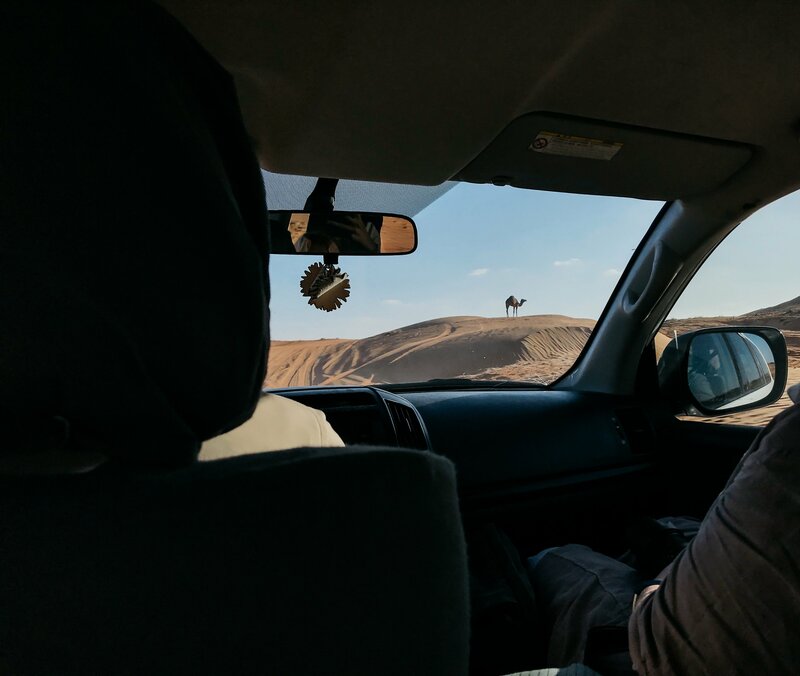 On this day, we drove about 150 km of the Empty Quarter through the Desert to the coast where the Desert meets the Indian Ocean. 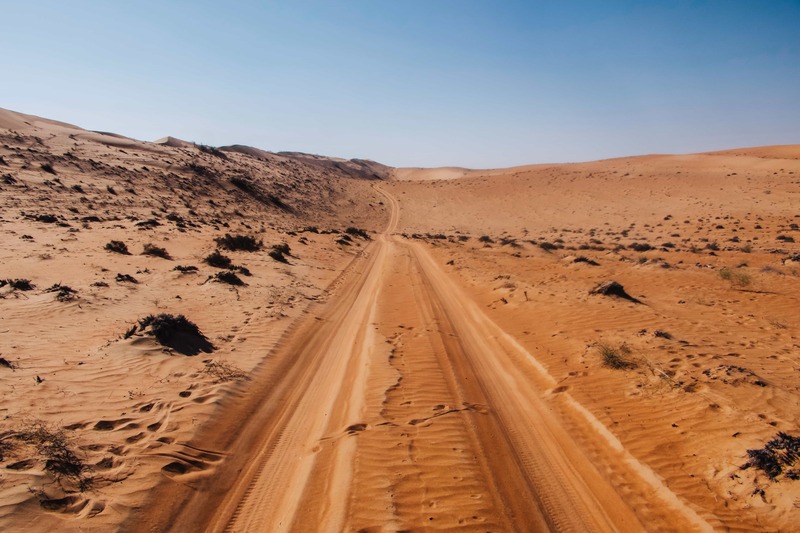 We off-roaded through the desert for about four hours before reaching the coast. We stopped at a small fishing village for a local fish lunch before continuing onwards to the Turtle Beach Resort. 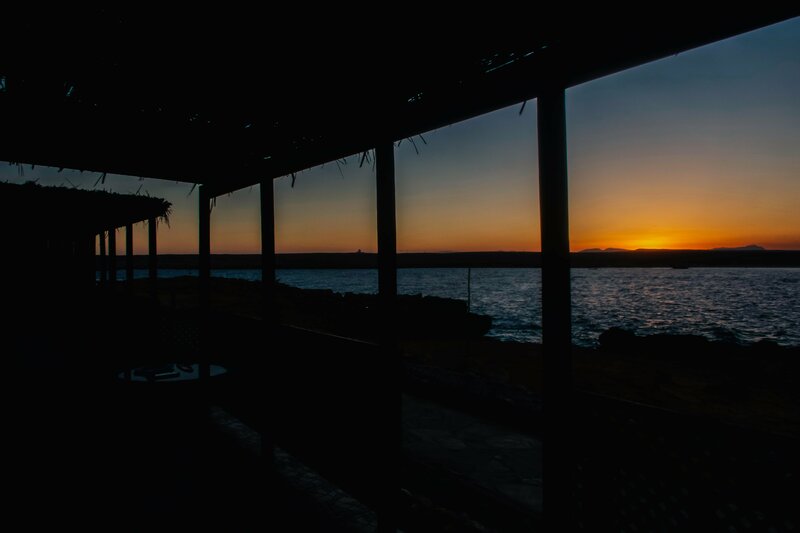 We were put in bungalows right on the water and so enjoyed watching sunset off our porch. That night we went to Ras al Had beach to watch the Sea Turtles nest. 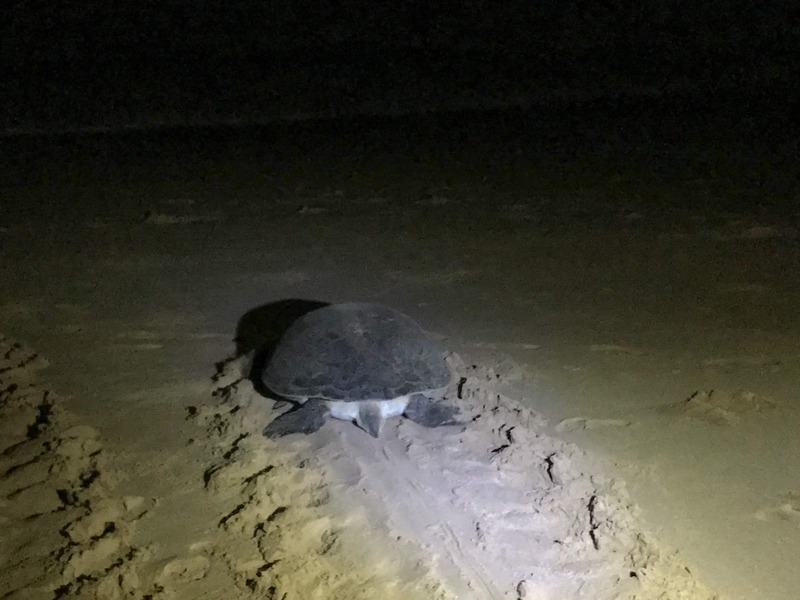 It was a bit later of a night than I had planned, but we saw two Green Turtles and a baby turtle. Expect to walk for about 20-30 minutes to see the turtles. 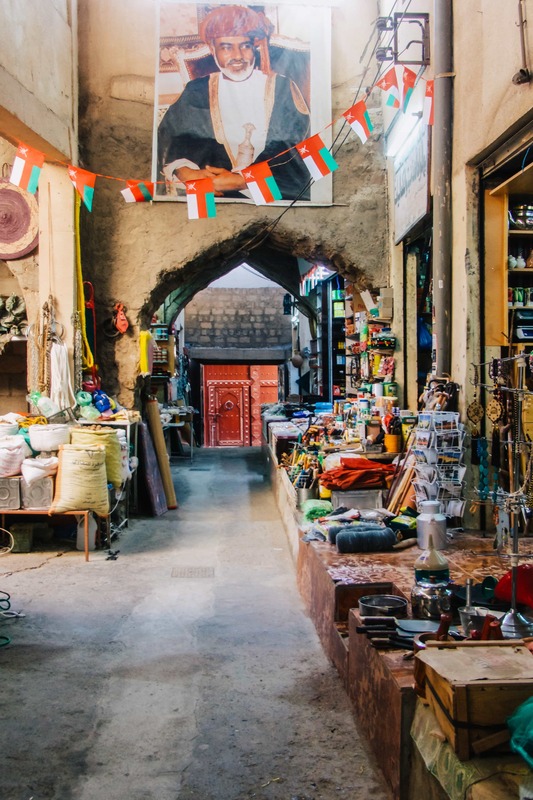 We started our day by driving to Sur where we stopped at a local Dhow building factory. 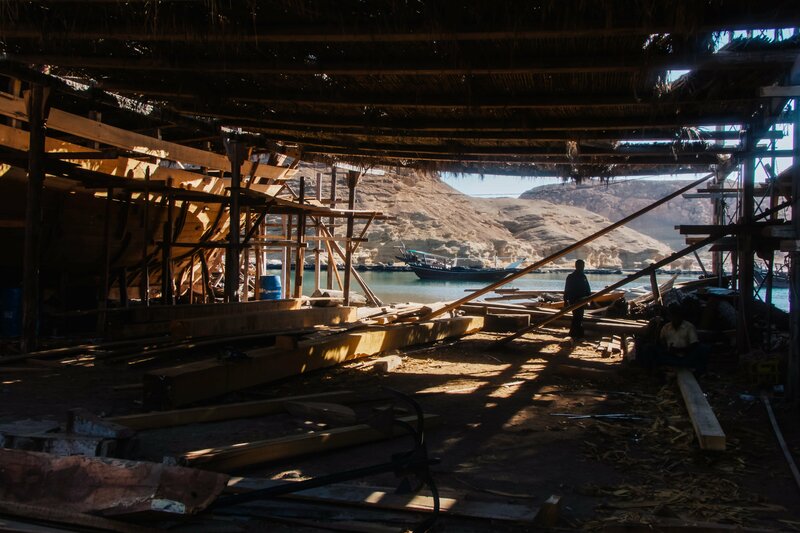 It was fascinating to see how these huge wooden boats are completely built by hand. 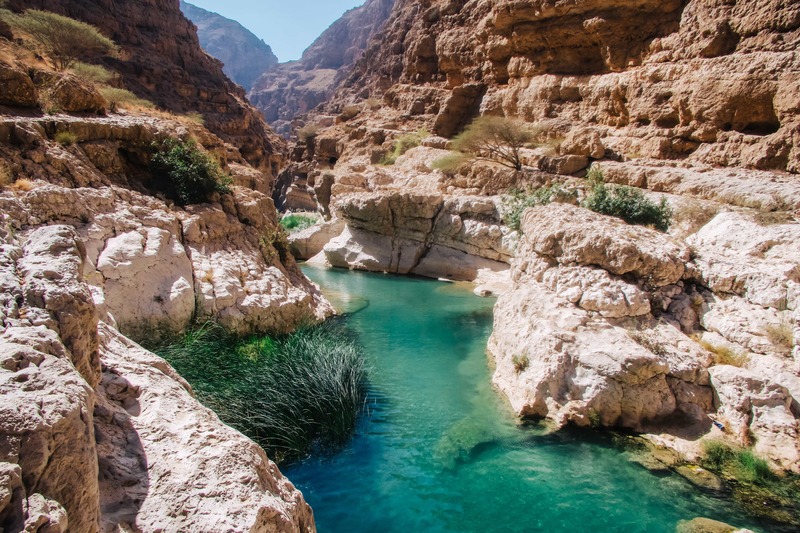 We continued further to Wadi Shab, which is a 2 hour hike through a Wadi to a crystal clear swim hole. It was an all around fantastic hike, albeit a bit hot. 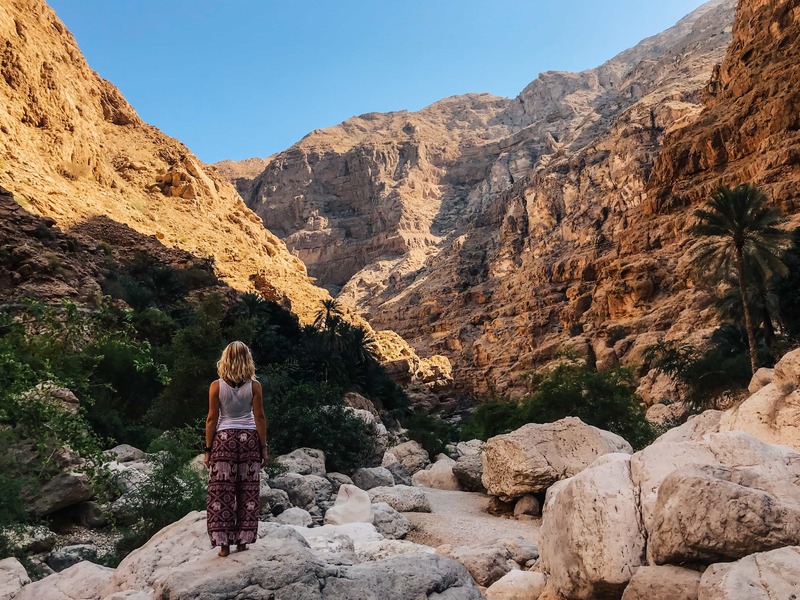 We then drove through Wadi Tiwi, and walked about 500 meters back down through the villages so that we can observe their unique doors and the views. 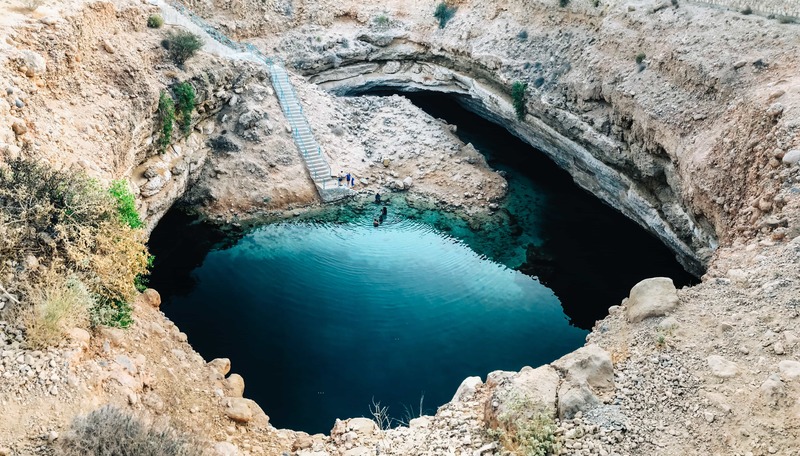 Our last stop of the day with Oman Safaris, before heading back to Muscat, was the Hawiyat Naim (Sinkhole) Park. 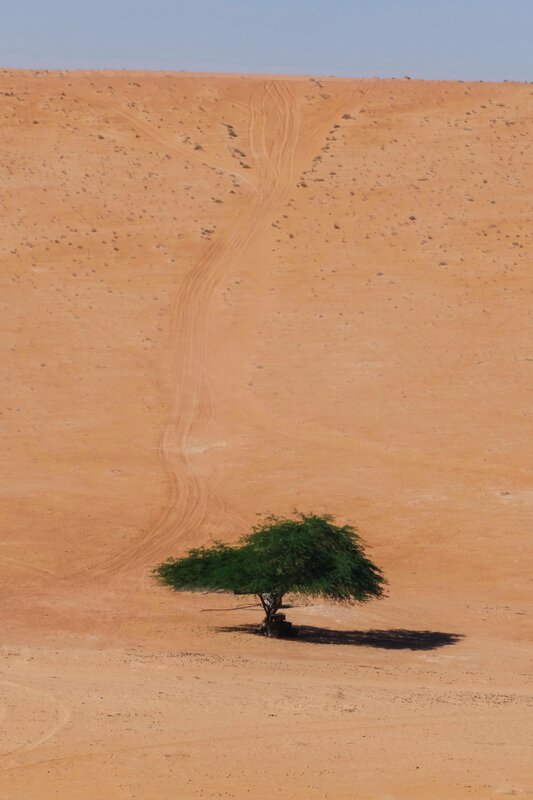 This was one of those images of Oman that I’d seen over and over and was afraid that we’d miss. It was quite cool to see. 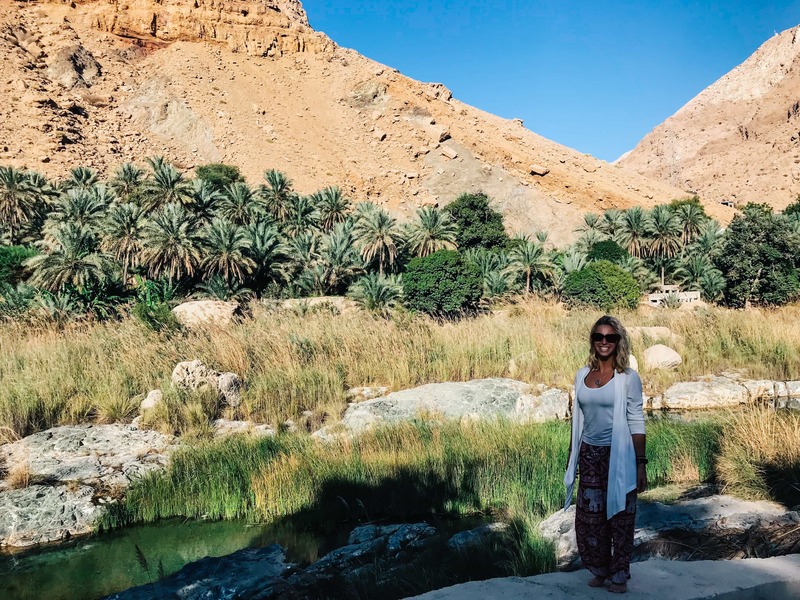 And just like that, four days with Oman Safaris flew by! 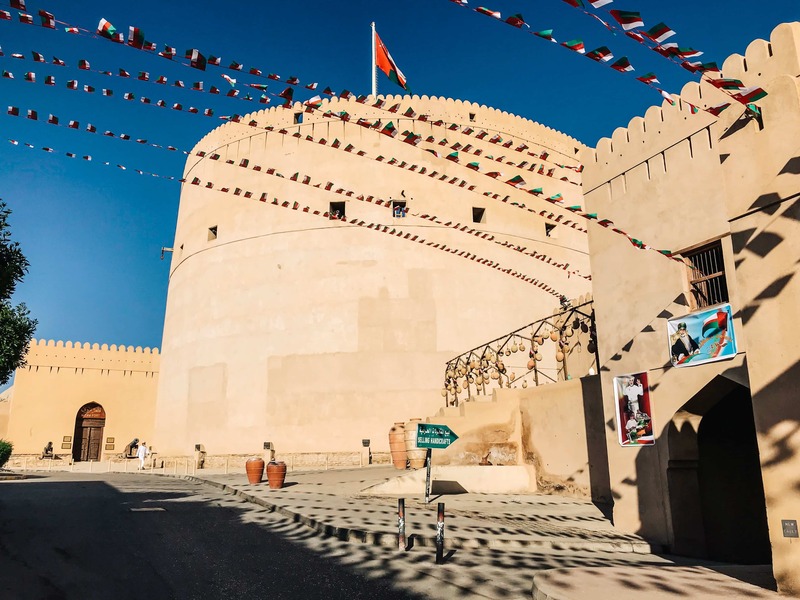 We had a remarkable time getting to explore Oman with Hamad and I couldn’t recommend his tour highly enough! 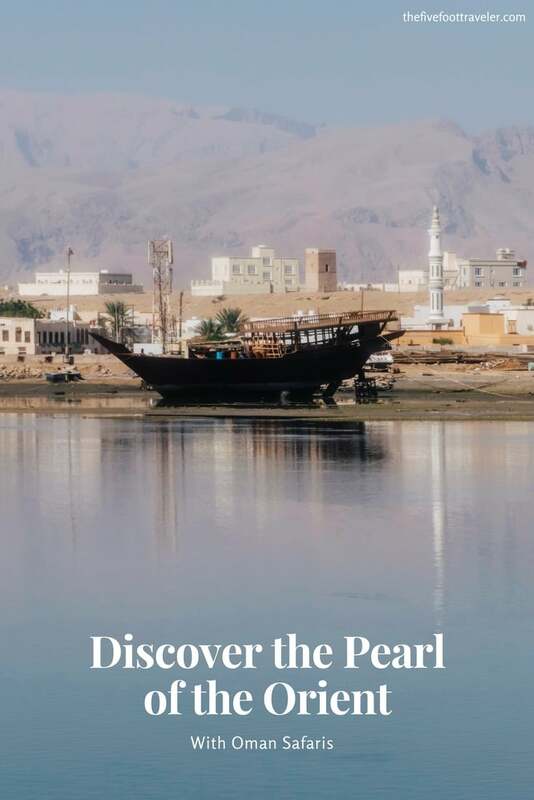 Interested in Oman Safaris? Pin It Please!